THE northern white rhino has become a step closer to extinction after one of its last breeding males died in Kenya, leaving only six of the species now left in the world. Suni, a 34-year-old northern white rhino, was found dead on Friday by rangers at the Ol Pejeta Conservancy. "Consequently the species now stands at the brink of complete extinction, a sorry testament to the greed of the human race," the Conservancy said in a statement. The animal, which was one of the last two breeding males of the endangered species, was not poached, according to the Conversancy, but his cause of death remains unclear. A post mortem on the rhino is expected to be carried out later this week by vets at the Kenya Wildlife Service. Suni was the first northern white rhino to be born in captivity. He was born at a Czech zoo in Dvur Kralove in 1980, but was moved to Kenya in December 2009 in an attempt to save the species from extinction. 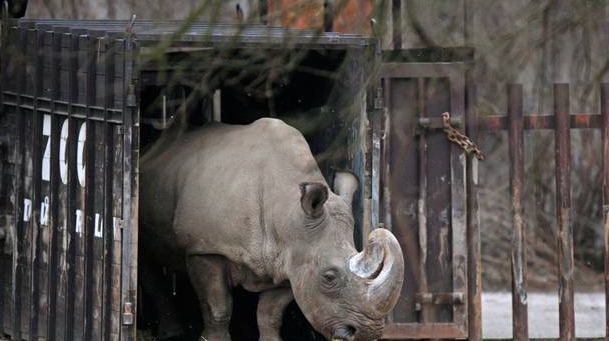 He was one of four northern white rhinos to be moved from the zoo into the wild, where it was hoped it would be easier for the animals to breed. "We will continue to do what we can to work with the remaining three animals on Ol Pejeta in the hope that our efforts will one day result in the successful birth of a northern white rhino calf," the Conservancy added. While there are thousands of southern white rhinos still roaming the plains of sub-Saharan Africa, decades of rampant poaching have drastically cut northern white rhino numbers. Gangs of poachers ship their stolen ivory to Asia, where rhino horn was valued higher than gold or platinum last year.